I am still organizing my thoughts about the chemical leak that has poisoned the water for more than 1 in 6 people living in the state of West Virginia. But I wanted to express at least a small part of my feelings here. Since learning of the chemical leak and subsequent "Aquapocalypse", my emotions have ranged from rage to despair, and everywhere in between. The cost to our public health is staggering. The impact on our environment is incalculable. And yet, I am also beginning to feel a sense of hopefulness that is unexpected and hard to explain. I am encouraged by the hundreds and even thousands of people who are standing in solidarity to take action and ensure that this never happens again. The sense of community and common purpose that is evident as neighbors assist neighbors overcome the challenges caused by this negligence. People are connecting to one another and demanding change. People are organizing. People are developing solutions. People are working together to challenge the status quo. I am beginning to see a glimmer of hope that this tragedy can be catalyst for transformation for our state. I asked the following question on Facebook, but I want to ask it here so that it can serve as a call to action. Are you ready to make West Virginia the best place in the country to raise a family? The way I see it, there is no reason why our state can't be the best place to raise children. We have great scenic beauty. Our state is blessed with rich natural resources and some of the most intelligent, caring, creative, talented, hard working people in the world. There is no reason why we can't develop innovative solutions that propel our state forward. There is no reason why we can't create the strongest early childhood system and best schools in the country. There is no reason why we can't improve our public health system so that our people are healthier and live longer, happier lives. There is no reason why we can't have a robust and diverse economy that promotes shared prosperity for all. There is no reason why we can't have clean drinking water, clean air, and the most pristine natural beauty. There is no reason why our children shouldn't have the happiest childhoods supported by loving, nurturing families and communities. There is no reason why West Virginia can't be the best place to raise a family. But it will take more than prayers and hopes to make that vision a reality. It's going to take a whole lot of hard work. It's going to take a whole lot of people working together. It's going to take every one of us working together in small and large ways to make it happen. But, you know what? We can do it. If we all work together, we can do it. 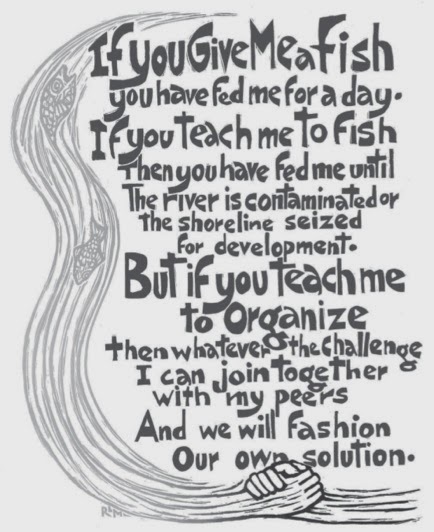 Illustration from "The Barefoot Guide to working with organizations and social change." See: http://www.barefootguide.org.